By the mid 1800's, the Samoan islands where under the direct, or indirect control of Germany, Britain, and the USA. The USA formally Annexing some of the islands as American Samoa. A civil war ensued, with the various Samoan tribes backed by the three powers. and looked like escalating when all three sent warships, only for a storm to devastate the respective fleets, ending the war. The islands where then split between America, forming American Samoa, and Germany. Britain relinquished its claims in return for Germany ceding some territories elsewhere to Britain, and relinquishing its claims to the Tongan islands. There was a proposal from Germany to use its tricolour, but defaced with an emblem specific to the Samoan islands. 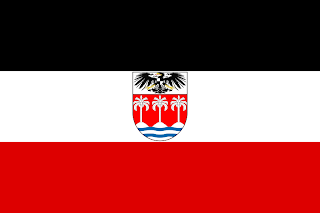 A coat of arms featuring 3 palm trees above waves and topped with the German black eagle. However, this flag never came into use because of the outbreak of WWI. At the outbreak of WWI, at the request of the British Empire, New Zealand landed on the Western Samoan islands, and seized control from the German authorities. From the end of the war, to 1962, the territory was governed by New Zealand under various mandates from the League of Nations to the United Nations. From 1922 to independence, the islands used a standard blue ensign, charged with a Western Samoan emblem in the fly. It consisted of a roundel, within which are 3 palm trees, and Taro, an important crop in the islands. 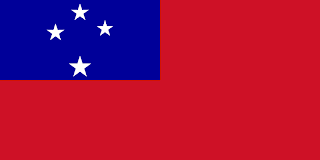 From 1925, a red ensign also came into use, also featuring the Western Samoan roundel. However, briefly, between 1948 and 1949, a new flag was introduced. 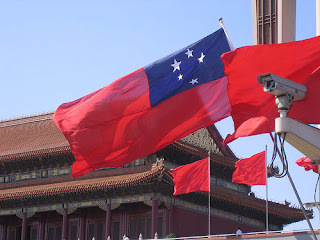 Taking the red ensign, the Western Samoan roundel was removed, and the Union Jack was replaced with 4 white stars laid out to replicate the Southern Cross constellation. In 1949, the current flag was adopted for the islands. It took the previous flag, and added in a fifth, smaller star, replicating the pattern on the Australian and New Zealand flags. The flag was being flown with independence granted in 1962, which saw the red and blue ensigns being dropped from use, and a new coat of arms brought in. Then, in 1997, the constitution was amended from Western Samoa, to Samoa.